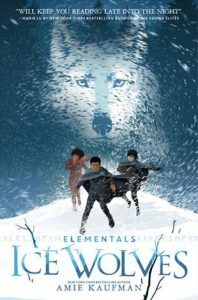 There’s a new fantasy series for young readers (and fans of shape-shifters) from author Amie Kaufman called Elementals. The first story, Ice Wolves, is headed to book shelves this March. It goes like this: “Everyone in Vallen knows that ice wolves and scorch dragons are sworn enemies who live deeply separate lives. So when twelve-year-old orphan Anders takes one elemental form and his twin sister, Rayna, takes another, he wonders whether they are even related. Still, whether or not they’re family, Rayna is Anders’s only true friend. She’s nothing like the brutal, cruel dragons who claimed her as one of their own and stole her away. In order to rescue her, Anders must enlist at the foreboding Ulfar Academy, a school for young wolves that values loyalty to the pack above all else. But for Anders, loyalty is more complicated than obedience, and friendship is the most powerful shape-shifting force of all.” Find out more over at Goodreads. 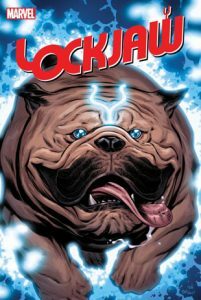 As you may recall, last year we noted that Marvel Comics had collected together several previous adventures of the furry fans’ favorite Inhuman, Lockjaw the teleporting dog. Well it looks as if that collection must have done rather well, because now Lockjaw has been granted his own full-color 4-issue miniseries. Marvel puts it like this: “Lockjaw spends most of his time defending the Inhuman empire alongside Black Bolt and Medusa. But when he gets a message that his long-lost litter mates are in danger, he’ll spring into action to save them! But wait – Lockjaw has brothers and sisters? Can they teleport? Are they Inhuman? Can they possibly be as gosh-darned cute as their big brother?” Written by Daniel Kibblesmith (The Late Show) and illustrated by Carlos Villa, the first issue of Lockjaw hits the shelves this week. Find out more over at Comicosity. Over at Cartoon Brew there’s an article about two new animated TV series coming to The Disney Channel in 2019. They have some interesting things in common: Both feature teenage human females transported to an unearthly other realm, and both have been created by storyboard artists who worked on the wildly-popular series Gravity Falls. One is a bit anthro, and one is very anthro! The former would be Owl House, created by Dana Terrace. “The show follows Luz, a self-assured teenager who accidentally enters a portal to the Demon Realm where she befriends a rebellious witch, Eda, and a tiny warrrior, King. Though she lacks any magical abilities, Luz pursues her dream of becoming a witch by apprenticing with Eda, and ultimately finds a new family in an unlikely setting.” On the other paw (flipper?) 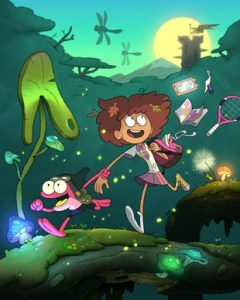 there’s Amphibia, from Matt Braly. 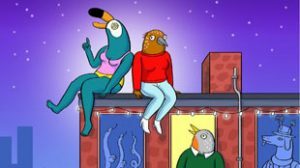 “The show tells the story of Anne Boonchuy, a self-centered teenager who is magically transported to the world of Amphibia, a rural marshland populated by frog-people. There she meets a young frog named Sprig, who will become Anne’s first true friend and help transform her into a hero.” Keep your ear-holes open for some more precise debut dates when we get them. Disney Channel is bringing back a childhood memory for many, and perhaps creating new memories for a new generation. This March they will premier a new Muppet Babies TV series as part of their Disney Junior line-up. (If you didn’t know, back in the 1990’s the original Muppet Babies 2D animated series was so successful that it spawned a flood of imitators, including Disney Babies and Warner Brother Babies, no less.) Interestingly, this will be the first Muppet TV series animated in CGI. (Also interesting: Jenny Slate (Dawn Bellwether from Zootopia) is one of the voice actors.) 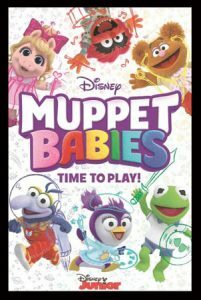 According to Animation Scoop: “Based on the original Emmy Award-winning series, the all-new CG-animated Muppet Babies chronicles the hilarious playroom antics of the young Kermit the Frog, Piggy, Fozzie Bear, Gonzo, Animal and brand-new Muppet Baby, Summer Penguin. The series will feature guest appearances by fan-favorite Muppets including: Statler and Waldorf, Bunsen and Beaker, Rowlf the Dog, Rizzo, and Dr. Teeth. Set in the vibrant playroom of an urban brownstone with an expansive backyard, the Muppet Babies have everything they need at their fingertips to lead them on their fantastical adventures.” The article has a lot more information, and a preview clip as well. Look for the new series to debut March 23rd. Atlas & Axis is a well-known and award-nominated funny-animal adventure graphic novel from Europe, written and illustrated by Pau. Now Titan Comics have brought us the first English-language edition, and they’re releasing it as a 4-issue comic miniseries through their Statix imprint. The publishers describe it like this: “In the fantastical world of Pangea, all the animals talk and walk on two paws. Warriors Atlas and Axis are mutts of very different pedigrees: Atlas is intelligent and rational, a calculating hero, while Axis is more likely to take a wild swing when his blood runs hot. When our roaming adventurers return home to find Viking raiders – brutes from the North who pillage and kill all who fall under their claws – have destroyed their village, they set off on a perilous quest across land and sea to save what remains of their friends and family!” Comicon.com have a more detailed look that includes several preview pages. And don’t be fooled: This is not a cute all-ages comic book! Bobby Timony (art) and his twin brother Peter Timony (writing) are the creators of Night Owls, an award-winning series from DC Comics that’s been available in print and on line since 2009. This Roaring-20’s-style adventure tells the story of two humans and a gargoyle who team up to solve supernatural mysteries. It features more than its fair share of non-human characters too, mind you. If you visit their web site (called, appropriately enough, Twin Comics) you’ll see much more of Bobby’s art and the brothers’ work on other comic series they offer on-line now. 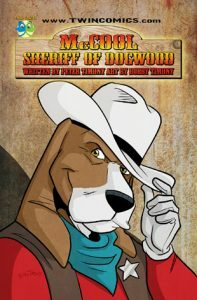 Among them Goblin Hood, Widdershins Wilderness Scouts, and (furriest of them all) McCool: Sheriff of Dogwood. Jessica Reilly and Patrick Reilly have both served in the U.S. military — she’s still in, while he recently left after nearly a decade of service. 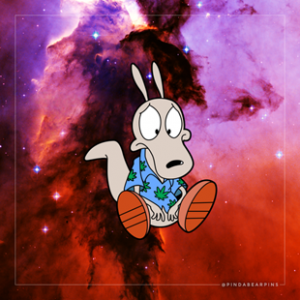 In their free time, they formed a company called Zonks Illustration as an outlet for their creative endeavors. 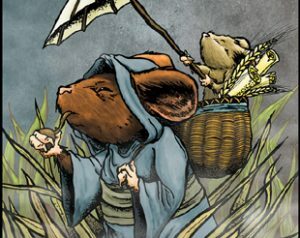 Among other things they’ve been working on Five Realms, a multi-species fantasy comic adventure reminiscent of Mouse Guard. He writes it, she illustrates it. You can see examples of her works over at their Zonks Etsy store. They also have a Patreon to try and get Five Realms out to the world. Another discovery from Long Beach Comic Expo was Pindabear, home for “super fresh enamel pins”. Featuring designs from anime, American cartoons, Pokemon, and other fannish pursuits. Over at their web site they have all their current designs, and they’re taking orders now for new pins as well as sold-out designs from the past they plan to re-stock real soon.